Ride waverunners/ jet skis freestyle in the Gulf with the largest riding area on Fort Myers Beach. The south end of the island has less boat traffic which equals safer riding and less worrying! You can rent waverunnners by the half hour or the hour, and you can ride single, double or triple! Awesome fun for the entire family! 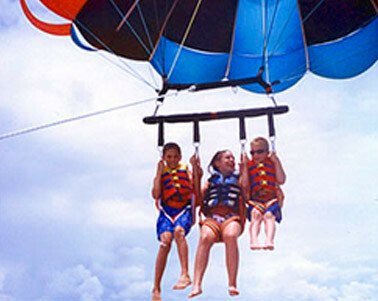 Customers are launched from our location on the Gulf and have a large (1 square mile) riding area out front. We do have to keep you in sight at ALL times and we will give you boundaries during your safety instruction. 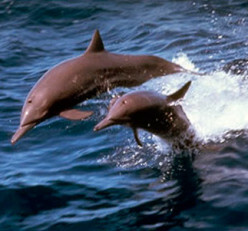 Check out the dolphin tour if you are looking to go out on an exploratory guided trip. Please bring a valid driver’s license for verification. Please call to confirm your requested departure time. Reservations booked prior to arrival are not guaranteed until confirmed by the vendor. Arrive at least 30 minutes early for instruction. 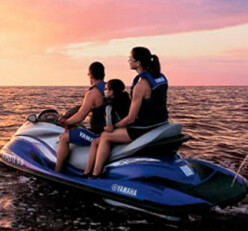 Waverunner rentals are available for rental year round. It is best to book at least one day in advance to avoid sellouts. We DO have a large fleet so MOST of the year you will be able to book your freestyle waverunner rental the same day and even do walk ups. Remember, planning your outdoor activities at the beginning of your trip is suggested. That way if inclement weather is a factor we can always move you to a later date. Parking is usually available and free at each hotel. Limited space is available on high volume days so it is recommended to take one vehicle for your party. The Wyndham location sometimes charges a minimal parking fee. The Sandpiper does not charge a fee. Park and walk out to the booth on the beach and you will be issued a parking pass for the time you are participating in water sports activities. If The Sandpiper parking lot is full, you may park at the Dakota beach access that is just a few houses to the North of the hotel. Most of the year parking is not an issue. ● Adults born BEFORE January 1, 1988 can operate a jet ski with a valid driver’s license without a Florida’s Boater License. ● Person signing the contract must be 18, have a valid picture ID, & a VALID credit card for incidentals, minors will need their parent to sign for them to participate. ● Those born on or after January 1, 1988 can operate a jet ski, but are required to take a Florida Boaters Test and must be 16 years old with a valid US driver’s license. These tests are available upon arrival for $3. They take approximately 30 minutes to complete. Please arrive early if someone in your party is taking this test. ● Total weight capacity is 450lb. ● This activity is not recommended for pregnant women. ● Children can ride along with a parent based on their size and ability to hold on while in motion. ● Jet ski’s have small compartments to hold smaller items. However, it is best to leave all valuable items back home or in your vehicle. The compartments aren’t waterproof and there is always a chance the latch could break. We can hold onto your keys etc.. in our lock box as well. ● If the weather is unfavorable for this activity and the vendor calls off the rental, we will attempt to reschedule for another time or day. If we cannot meet customer demands for this, we’ll refund the purchase amount. Customers may cancel at least 24 hours prior to their arrival date and time to receive a full refund minus a $5 service fee. Customers that cancel after the 24 hour period will not be eligible for a refund. If weather or waves are unfavorable and the vendor calls off the rental, the rental may be rescheduled for a later time/date or a full refund will be issued. No-shows will not be refunded. Customer may make changes to the reservation without any fees as long as it’s outside the 24 hour cancellation period.